CARACAS, Venezuela -- Until recently, Julio Noguera worked at a bakery. Now he spends his evenings searching through the garbage for food. "I come here looking for food because if I didn't, I'd starve to death," Noguera said as he sorted through a pile of moldy potatoes. "With things like they are, no one helps anyone and no one gives away meals." Across town, unemployed people converge every dusk at a trash heap on a downtown Caracas sidewalk to pick through rotten fruit and vegetables tossed out by nearby shops. They are frequently joined by small business owners, college students and pensioners - people who consider themselves middle class even though their living standards have long ago been pulverized by triple-digit inflation, food shortages and a collapsing currency. Venezuela's poverty had eased during the administration of the late President Hugo Chavez. But a study by three leading Caracas universities found that 76 percent of Venezuelans are now under the poverty line, compared with 52 percent in 2014. "We're seeing terrible sacrifices across many sections of society," said Carlos Aponte, a sociology professor at the Central University of Venezuela. "A few years ago, Venezuela didn't have the kind of extreme poverty that would drive people to eat garbage." "I'm a trained baker, but right now there's no work anywhere here. So I make do with this," he said. The trash pickers aren't just people who've lost their jobs. "I used to be able to find food, but not anymore. Everything is lines," she said after an evening picking through the refuse. 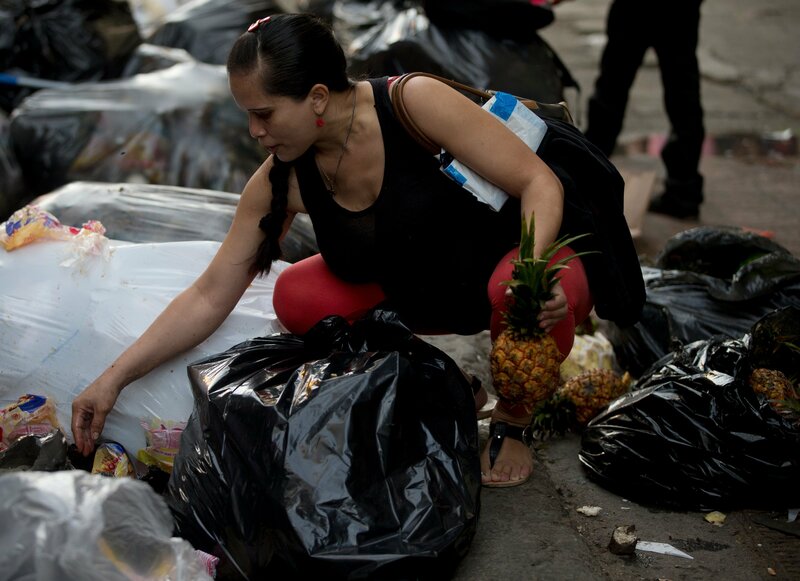 Dumpster diving isn't a new phenomenon in Venezuela, but it is a growing one. Venezuela was once the richest nation in South America, but a fall in oil prices combined with other economic problems has sparked desperation. The government blames the political opposition, accusing it of waging an "economic war" to stir unrest and oust President Nicolas Maduro from power. The administration has launched an aggressive program to build urban farms in an effort to address food shortages. "I'm a single mother with two children, and this is helping me get by," she said.